Cracking in tablets during the compression is a major problem in tablet manufacturing. Some causes and solutions of the cracking of tablets are given here. Cracking is a situation in which small cracks are identified on the top and bottom central surfaces of tablets during the processing of the tablets or during their subsequent use. Hardly are the cracks identified on the sides of the tablets but mainly on the top and bottom surfaces. The cracks occur mainly due to exaggerated and rapid expansion of the tablets, this is mainly when deep concave punches are employed during the processing stages of the tablet. Cracking may be related to formulation (granulation) or it may be related to the operation of the machine that is used during the processing of the drugs. During granulation, large particles are formed (granules) during the processing of the tablet. This may occur mainly due to the occurrence of errors in the formulation of the tablet components hence creating inconsistent and unintended bonds within the tablet. This leads to the creation of larger multi-particle entities in the drug. In cases where large sizes of granules are the main cause of the cracking of the drugs, the size of the granules can be reduced and finer granules can be used to avoid the occurrence of large particles within the drug and, therefore, avoid the cracking of the drug. The use of very dry granules during the formation of the tablet is another cause of the cracking of the tablet. 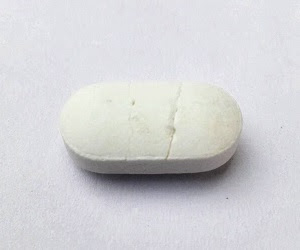 In order to avoid cracking as a result of weak attachment of the particulate granules found within the tablet, the granules should be moistened well and an adequate amount of binder should be used during the formation of the tablets. Expansion of the tablets (which is another reason for the cracking related to formation) can be avoided by the use of dry binders to control the expansion of the tablets. Granulation should be done at room temperature since granulation at very cold temperatures also leads to cracking. Machines also lead to the cracking of the tablets. During the ejection of the tablet, for instance, the tablet expands due to the presence of air within it, to avoid this tapered die should be used during the ejection of the tablet. Deep concavities also cause cracking during the removal of the drugs, therefore, special take-offs should be used to avoid the cracking of the drugs during the removal process. It is therefore important that the drugs are prepared using the put up standards of the drug formulation. The amount and ratios that are used to formulate the drug should not be ignored but rather followed. The machines that are to be used in the drug processing industries should be continuously serviced and checked for any errors that may hinder or affect drug processing negatively. Only the learned or well-experienced individuals should be allowed to handle the formulation of drugs. It is important for the well experienced to handle equipment to avoid the creation of substantial loss in the company or institution as a result of poor drug preparation. Drugs are important for the sick, don't let them crack. Dear Ankurji, Cracking of Tablets on the surfaces are rare, as lumps formed after Granulation go through Tremendous Break-down & Distribution of RMG Blades & Multi-Mill , If Mass Mixer is used lumps are broken down by passing thru Multi Mill then Dried granules size Reduction done passing through various mesh size as per Requirement, I completely dont agree with your Blog. I am unable to understand that you want to say about the tablet cracking. Please write clearly that you think about the topic.